Note: This article was originally published at the Statistically Speaking blog at MVN.com on February 28, 2008. Since the MVN.com site is defunct and its articles are no longer available on the web, I am re-publishing the article here. In Part 1 of this series, we examined Brian Bannister’s suggestions for why he has been able to beat the league BABIP. He indicated that it was probably due to pitching more often in favorable pitcher’s counts and inducing balls in play with two strikes, when the hitter is against the ropes. However, the evidence didn’t show much advantage for Bannister. We noted that he did pitch a little more often in favorable counts, but this led to him avoiding walks more than anything; it had little salutary effect on his BABIP. In Part 2 of this series, we learned about the pitches that Bannister threw during 2007 and how he used them. We saw that the fastball and curveball were good pitches against right-handed hitters, and the slider was a good pitch against left-handed hitters. In this final part of the series, we’re going to marry those two approaches to see if we can uncover any patterns that might explain Bannister’s BABIP performance. In this portion, I’m not concentrating so much on evaluating Bannister’s own statements, as I did on Part 1. Rather, I’m thinking more about what we can expect from Bannister in the future. I’m also interested in investigating techniques that could prove useful for evaluating DIPS theory on a component basis as we accumulate more PITCHf/x data in the coming seasons. Should we expect Bannister to maintain any of his BABIP edge and thus his 3.87 ERA from 2007? Or are the projection systems like PECOTA (subscribers only) and CHONE more reasonable when they project an ERA of 5.19 or 4.74? Note: This article was originally published at the Statistically Speaking blog at MVN.com on February 26, 2008. Since the MVN.com site is defunct and its articles are no longer available on the web, I am re-publishing the article here. In Part 1 of this analysis, we examined the league numbers for batting average on balls in play (BABIP) and whether Bannister was able to beat the league BABIP by pitching in favorable counts. We found that he did not gain any particular advantage by inducing more balls in play on two-strike counts, so we turn elsewhere to seek an explanation for his 2007 performance. What pitches does Brian Bannister throw? The scouting reports tell an interesting tale, especially if you follow them back a couple years. In the minor leagues, the cut fastball was reputed to be his best pitch. His four-seam fastball was thrown in the high 80’s, touching 90, although he was able to locate it well, his curveball was a big breaker that was considered a plus pitch, his changeup was a work in progress, and his slider was regarded as a pitch likely to be scrapped. But in the fall of 2006 in the Mexican League, Bannister worked on a two-seam fastball, and after joining the Royals in trade for Ambiorix Burgos, he scrapped his cutter, experimented with different speeds on his curveball, and started throwing a slider again. 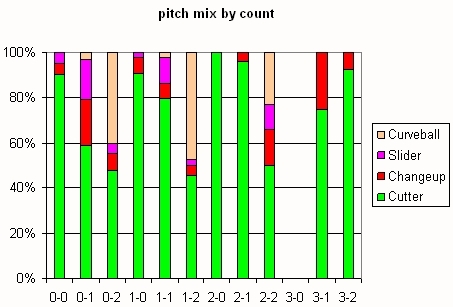 What can we see in the PITCHf/x data regarding his pitch repertoire in 2007? Note: This article was originally published at the Statistically Speaking blog at MVN.com on February 24, 2008. Since the MVN.com site is defunct and its articles are no longer available on the web, I am re-publishing the article here. I’ll warn you from the start that the title is a tad ambitious. I don’t know exactly how Brian Bannister wins in the major leagues with a below-average fastball speed, but I hope to share some of what I have learned on the topic. This article will take the form of a three-part series. In case you’ve been hiding under the proverbial sabermetric rock the last few weeks–maybe you’re one of those weirdos who believe players are human or you’ve been out of your garage recently to look at the sky–Brian Bannister gave a fascinating three-part interview to Tim Dierkes at MLB Trade Rumors last month. In Part 3 of the interview, Bannister talked about his opponents’ batting average on balls in play (BABIP). I think a lot of fans underestimate how much time I spend working with statistics to improve my performance on the field. For those that don’t know, the typical BABIP for starting pitchers in Major League Baseball is around .300 give or take a few points. The common (and valid) argument is that over the course of a pitcher’s career, he can not control his BABIP from year-to-year (because it is random), but over a period of time it will settle into the median range of roughly .300 (the peak of the bell curve). Therefore, pitchers that have a BABIP of under .300 are due to regress in subsequent years and pitchers with a BABIP above .300 should see some improvement (assuming they are a Major League Average pitcher). Because I don’t have enough of a sample size yet (service time), I don’t claim to be able to beat the .300 average year in and year out at the Major League level. However, I also don’t feel that every pitcher is hopelessly bound to that .300 number for his career if he takes some steps to improve his odds – which is what pitching is all about. In the interview, Bannister postulated a reason for his success on BABIP. So, to finally answer the question about BABIP, if we look at the numbers above, how can a Major League pitcher try and beat the .300 BABIP average? By pitching in 0-2, 1-2, & 2-2 counts more often than the historical averages of pitchers in the Major Leagues. Until a pitcher reaches two strikes, he has no historical statistical advantage over the hitter. In fact, my batting averages against in 0-1, 1-0, & 1-1 counts are .297/.295/.311 respectively, very close to the roughly .300 average. My explanation for why I have beat the average so far is that in my career I have been able to get a Major League hitter to put the ball in play in a 1-2 or 0-2 count 155 times, and in a 2-0 or 2-1 count 78 times. That’s twice as often in my favor, & I’ll take those odds. Bannister also mentioned to Dierkes that getting two strikes on the hitter gives him the strategic advantage in terms of pitch selection. We do know from John Walsh’s work something about batting average and slugging percentage against the typical major-league fastball (.330/.521) and curveball (.310/.471). If Bannister is correct in his numbers, he’s doing quite a bit better than the league with both the fastball and curveball. But is Bannister correct in the numbers he quotes and assertions he makes? So far, most people are accepting what Bannister said at face value. Let’s take a closer look and see if we should believe his numbers and conclusions. We’ll draw on two data sets from the 2007 season. One is the standard pitch-by-pitch result data for all of Bannister’s 2603 pitches in 2007. With this data set we can examine results on balls in play and how Bannister performed in various ball-strike counts. The second data set is the detailed PITCHf/x trajectory data recorded for 1304 of Bannister’s pitches, or about half of his starts. With this data set we can identify pitch types and reliable strike zone location information in order to gain a greater understanding of Bannister’s pitching strategies. Note: This article was originally published at the Statistically Speaking blog at MVN.com on December 22, 2007. Since the MVN.com site is defunct and its articles are no longer available on the web, I am re-publishing the article here. What if we knew what type of pitches every major league pitcher threw? What if we had detailed pitch-by-pitch data about how he used those pitches in every game situation? What if this information was accurate and freely accessible to baseball researchers? “When the system is installed in all 30 ballparks, it will provide unprecedented accuracy, consistency and depth of data to the measurement of speed and trajectory of each pitch,” Schwartz said. “Ultimately we’ll be able to use this data to determine the pitch type in real time and with greater accuracy than ever before. By recording all of this data in real time, we can provide it to broadcasters such as FOX, in-stadium scoreboards, fans via Enhanced Gameday, clubs and other business partners. 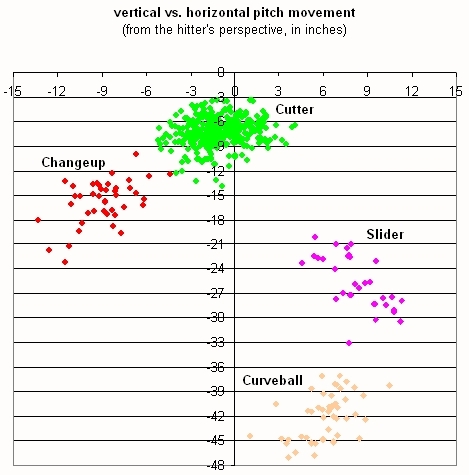 It wasn’t long before Baseball Analysts’ Joe Sheehan was leading the public research down that path, too, publishing articles in the spring of 2007 about pitch classification for pitchers like Jeff Weaver, Mike Mussina, and Kenny Rogers, using the data from the 2006 playoffs. 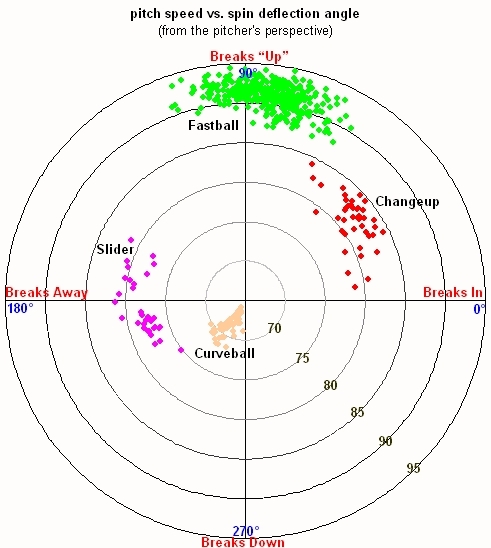 In April 2007, the PITCHf/x system was installed in nine ballparks, and this produced a wealth of data that encouraged more people to join the analysis fun. Dan Fox, Bill Ferris, and Steve West were among the leading PITCHf/x researchers in the first half of 2007, and although the work in the field covered a number of topics, pitch classification was often at the forefront. Soon the quest turned toward developing a set of rules to classify pitches for many pitchers, perhaps for every major league pitcher. John Walsh published the early definitive article on this topic. In August, the analysis really began to heat up; for example, see these articles from John Beamer and Joe Sheehan. The quest for a pitch classification algorithm was on. Note: This article was originally published at the Statistically Speaking blog at MVN.com on February 18, 2008. Since the MVN.com site is defunct and its articles are no longer available on the web, I am re-publishing the article here. Recent evidence may suggest otherwise, but I am still a contributor to Statistically Speaking. I’ve been working on an analysis that has been more difficult to bring to fruition than I expected; that, along with “real life” getting in the way more of late, is what has severely cut into my posting frequency. However, in the process of number crunching for the analysis I’m doing, I came across some statistics that I haven’t seen posted publicly anywhere, not even in the Baseball-Reference splits. (Some of it is in the B-R splits, but not most of it.) Maybe I’ve just missed them, in which case drop me a line and let me know where else you found them. I thought these might be interesting to a few other people, so I’ll share them. Mostly, I’m just putting the numbers up here for the rest of you to enjoy, but I’ll also make a few comments on some trends that stuck out to me. I’m looking at pitch data broken down by ball-strike count. I’m using the MLB Gameday 2007 data as my source. Today I present the breakdown of types of balls put into play by the hitter. A hitter reaches base safely more often on balls in play when the count is in his favor. Don’t change the channel, the revelations like that just keep on coming at StatSpeak, and you don’t want to miss one! Okay. My first slightly less than completely and utterly obvious observation is that the home run rate is strongly tied to the count. The doubles rate shows the same effect, but smaller, as does the triples rate to some extent. The singles rate stays pretty flat with respect to count, although there is a bit of an inverse effect–in better hitter’s counts, the hitter gets more extra base hits and slightly fewer singles.I haven’t looked at the type of batted ball (fly ball, line drive, ground ball, bunt, etc.) that results in hits. That’s a bit more difficult to parse out of the Gameday data. Since it doesn’t have its own field, getting that information requires some regular expression matching on the text description of the play. That’s fairly straightforward but nonetheless a nontrivial bit of coding that makes it a project for some point in the future rather than part of this data set for me. Another thing I noticed was that there were more groundouts and less flyouts the more strikes and less balls there were in the count. As pitchers gain the upper hand, they tend to get more groundball outs. I didn’t include popups and line drives in the accompanying chart since they didn’t show a strong tendency relative to count. I saw a couple other things that are obvious once you think about them, but it was interesting to me to see them reflected in the data. 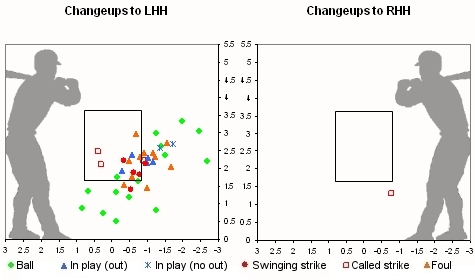 The first was that force outs, GIDPs, and fielder’s choice outs all go down dramatically with a 3-2 count, dropping from 6.4% to 2.3% of balls in play. Presumably this is because the runners are often going with the pitch on 3-2. If I don’t get around to presenting my full analysis in a timely fashion, I’ll see if I can present a few more statistical tidbits like this along the way. Note: This article was originally published at the Statistically Speaking blog at MVN.com on December 13, 2007. Since the MVN.com site is defunct and its articles are no longer available on the web, I am re-publishing the article here. I don’t know any other major league pitcher who relies on his cut fastball to nearly the same extent as Mariano Rivera, but there are many pitchers who use a cutter to some degree. Most of them, like Josh Beckett, merely put a little “cut” on a fastball now and then, and it’s debatable whether to classify it as a separate pitch in their repertoire. Some of them, like Greg Maddux, throw both a cut fastball and another fastball as fairly distinct pitches. A few others, like our subject today, throw a single type of fastball that moves more like a cutter than it does like a traditional four-seamer. Do we also label this kind of a pitch a cut fastball? The cutter is second only, perhaps, to the slider in the flexibility of its definition. Almost every starting pitcher is said to throw a cutter by an obscure report somewhere. I’ve learned to discount these notional references, but I pay a lot more attention when the pitcher himself or his catcher says he threw a cutter. Which brings us to Joakim Soria, closer for the Kansas City Royals. The Royals picked him up from the San Diego Padres in the Rule 5 draft last winter, and what a find that was! He had been pitching well in the Mexican League, and showed his stuff for the Royals last year when the closer of plan, Octavio Dotel, was first injured and later traded. Soria appeared in 62 games, pitched 69 innings, allowing 46 hits, 19 walks, and only three home runs, while racking up 75 strikeouts to go with 17 saves and 2.48 ERA. “It’s hard to pick him up. His ball has a natural cut to it. Not as much as [Rafael] Soriano but it does have a cut to it. That’s just his natural fastball,” Buck said. So his catcher calls his fastball a cutter. Let’s take a look at the data we have from PITCHf/x for the 2007 season, covering 477 pitches for Joakim Soria. I’ll begin with a graph of pitch speed versus the angle at which the spin on the ball is deflecting the pitch. Soria has a fastball with a lot of cut that runs 89-94 mph. The cut fastball is his bread-and-butter pitch; he uses it for 69% of his pitches to lefties and 78% of his pitches to righties. He has a changeup with a lot of lateral action that he throws 80-84 mph. He uses the changeup almost exclusively to lefties, making up 19% of his pitches to them. As his off-speed pitch to righties, Soria uses a slider with a big break that runs 76-81 mph. The slider makes up 11% of his pitches to right-handed hitters. Rounding out his repertoire is a slow curveball that Soria throws 66-71 mph. The curveball makes up 10% of his pitches, and he uses it equally to lefties and righties. Let’s look at how these pitches move from the hitter’s perspective. All of Soria’s pitches have good movement. His fastball has”cut” to it, and his changeup has good lateral and vertical movement when compared to his fastball. His slider looks like most pitchers’ curveballs, and his curveball is a slow ball with a lot of drop. Next, let’s look at what pitches Soria throws in each ball-strike count. 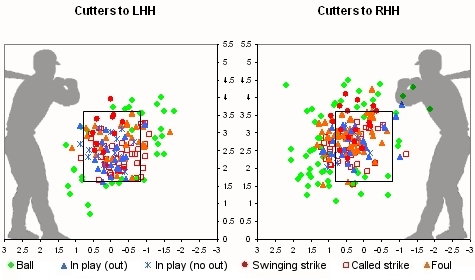 We can see that until he gets a strike, Soria uses almost only the cut fastball, and when he gets two strikes, he brings out the curveball pretty often, except in a 3-2 count, where he sticks with the cutter. This would imply that the curveball is his strikeout pitch and that he has trouble getting strikes with his off-speed pitches. As a second opinion, you can look at what Josh Kalk’s algorithm spit out for Joakim Soria. Josh also has release point data there if you are interested in that. Finally, let’s examine where Soria throws his pitches and what results he gets. CS=called strike, SS=swinging strike, IPO=in play (out), IPNO=in play (no out), TB=total bases, BABIP=batting average on balls in play (including home runs), SLGBIP=slugging average on balls in play (including home runs). For Strk% all pitches other than balls are counted as strikes. Con% = (Foul+IPO+IPNO)/(Foul+IPO+IPNO+SS). Our earlier conclusions seem to hold up. Here are Soria’s results for the cut fastball. 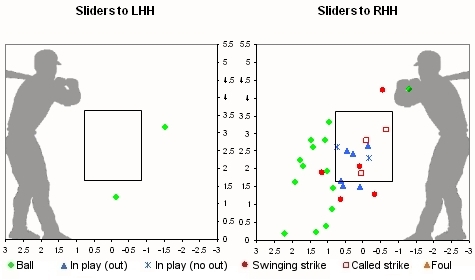 To lefties, Soria seems willing to pound the zone with the cutter, and his results indicate that strategy works. Against righties, he works more up and away. He misses the zone a little more often, and he generates more foul balls, but his results are still good. As I mentioned earlier, Soria uses the changeup to lefties and the slider to righties. In both cases, he likes to throw down and away. It looks like he has trouble throwing the slider consistently for strikes. Last, but not least, the curveball. Soria gets a lot of swinging strikes in the zone to both lefties and righties. The only difference appears to be when he misses–down and away to righties, and up and away or down and in to lefties. 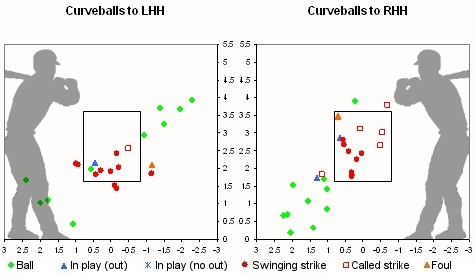 Since I mentioned earlier that the curveball looked like Soria’s strikeout pitch, let’s check on that. We have PITCHf/x data for 40 of his 75 strikeouts. For those 40 K’s, 23 of them were on the curveball, 9 on the cutter, 4 on the changeup, and 3 on the slider. I hope you enjoyed the analysis of one of my favorite players from my favorite team. My work’s had a bit of an “East Coast bias” lately, which feels a bit odd to me. I don’t expect to continue solely in that vein. If nothing else, you should see a Royal popping up in this space now and then.